I call today Allegheny County property assessment day... anyone remember why? documenting the obvious, but Forbes has us on their list of the college capitals in the US. Bloomberg reports on a new study that shows the percentage of mortgages with negative equity values. The story gives 9% for Pennsylvania which must be one of the lowest numbers across all states although I don't have the full report. I wonder if we also have a smaller percentage of homes with mortgages to begin with which would be relevant to that type of comparision. I would like to know the actual percentage of homes (not of mortgages) that are underwater by MSA. Anyone know if that is out there from any source? 40% of Pittsburgh area homeowners have no mortgage at all on their property according to the census, that would be one of the highest percentages by far among large regions in the nation. There are only a few regional options for the East of Mississippi Maglev concept that the Feds announced last week. News from DC does not look promising for them. Maybe we will get a summary judgement. New to the party is a plan for Maglev between Atlanta and Chatanooga. It's them or us for the next round of seed money that will just keep the idea alive. I didn't think the state had such straight lines.. but let's see... that network must be at least 500+ miles of track. We are now wistfully thinking that there is a shot at building 35 miles of trackless Maglev... assuming the planets line up, Federal money rains down and cold fusion turns to work that is. Funny you see no thought of a line that would be direct to Cleveland? True high speed rail between Pgh and Cleveland would be what? a hour ride? We could have cross city commuters easily enough. Think how much easier those away Steelers games would be. Some association of Turnpike vendors would probably oppose the idea. I was thinking that the media had not looked into as much as it should the recent news that airport landing fees here are going up even more. It's a big issue that gets to the competitveness of the airport, let alone the region. If you compare all the ink spent in the 1990's over how important the airline industry was for the region (back when say we had to explain away all the bonds and spending on the new terminal) to the minimal notice of the issue today... curious. but you have to wonder whether any airline will want to add any more flights than they have to in the current circumstances.... and airport finances are a topic unto themselves that have not been looked at too much. If you ignore my own quote, there was a good writeup on the implications of the airline industry here by Dan F. some time ago.. see How to factor reliable air service into the growth equation. It's from 2004 which is an interesting perspective. At the time the loss of USAir jobs was bad, but I don't think even then anyone fully contemplated just how utter the collapse of the airline industry and air service would be in a few more years. Let's hope my quote was at least half right... if what everyone tried to say in the 1990's that air service was the key to regional growth, then the converse would mean things are real bad here these days. That is all being swamped right now by the bigger airline news that Delta is acquiring Northwest. The vagaries of the airline industry and how it is changing is way beyond me. Just a guess, but I bet this is not good news for the hope we had of getting a direct Pittsburgh-Amsterdam flight which was going to be KLM.. but I honestly base that on nothing concrete. It almost happened I hear. What it means for the future of flight availability in general here I won't even guess. Can it get worse? 1) Who is USAir going to merge with next? 2) You couldn't pay me to take Ken's job these days. update: I really had not seen this when I first posted the above. By the IHT and NYT have a piece on point today: Airports are expanding, but timing couldn't be worse. We get an honorable mention in there. I didnt catch this last week. But the Christian Science Monitor has a US Map of a 'hardship index'. It's a pretty amazing map. It's not just that we are in their 'low' category, but we are low within a sea of misery. See the entire map below, but also see the midatlantic blowup I zoomed in on. I don't see many places in the country that show up in the low category that are not explained by some broader mega-regional pattern. WSJ numbers guy has a decent roundup of recent news on the political numerology that is engulfing us. Something old. I mentioned this before, but as we all obsess on polls, the best historical compilation of presidential polls is in this from the real numbers guys at Columbia: Presidential Campaign Polls 1952-1992.
and still my favorite, the New School's Parsons Institute for Information Mapping (PIIM) Voting Tool. You really need to try it out by launching the application (click on the map on the left of the intro page). Top of the fold front page of the Financial Times yesterday: US Public Pension funds face big losses. Let's see, last we heard on this subject the city pension fund lost 55 million dollars in the first half of the year. 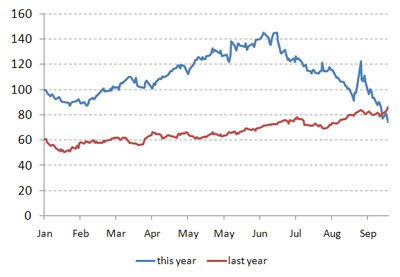 The first half of the year was like a bull market compared to the last couple months. (ok.. that's a bit of hyperbole but you get the point). As of July 1st the city pension fund is reported to have $330 million in hand. On July 1st the Dow Jones was at 11,382 - yesterday's close was just a tad over 8,175 or a 28% decline. Nasdaq was at 2,304, today it is 1505 or a 35% decline. A lot of things that some public pension funds like to hold because they were so 'safe', things like Fannie Mae and Freddie Mac stock, have gone bust altogether. Not going to just be the city pension fund that has issues. One week until we all go vote right? Need to figure out where to vote? I will put links to my google map mashups below. But I don't want to confuse anyone. The dots that google puts onto the maps are not the polling place locations, they are just there for reference. To figure out where your polling place is located, or to check your registration, Allegheny county has a really good online Polling Place Locator. Check it out now if you have never voted here before and want to confirm where to go next week. It also allows you to check that your registration has been recorded which could be helpful if you recently registered or re-registered. This I know may be too wonkish to take hold in public, but if you want to see the ultimate proof of the failure of public transit in the region, see this report out recently that really looks at the impact of gas prices on driving behavior across regions. Take a look at the graphic there and how Pittsburgh is one of only 3 regions with a negative correlation between gas prices and congestion. It looks like we have the single most negative correlation. What it means... we are just about the only region where increasing gas prices have not lowered the amount of driving here unlike virtually every other region in the country. Think about that. No one representing National Union Fire Insurance Co. of Pittsburgh, an AIG subsidiary, showed up for trial to defend the company that owned the pickup truck involved in the incident and the employee who drove it. Nobody showed up? At all? The 18mil settlement is just the lawyers attempt to get money quick. Because nobody showed up to defend the case, the original judgement was for $75 mil. The lawsuit settlement appears to be one of the largest in the state's history for a personal injury case, local lawyers said. That is quite a story if a local insurance company makes history just because somebody forgot to retain counsel? On the ground in Pittsburgh I know it seems like this is a case of the big fish gobbling up the smaller fish, but for sure National City was once the much larger institution. Go back a few years and suggest PNC was going to buy NatCity and you would have been laughed at for not predicting it would happen the other way around if anything. Forbes has a short positive headline on it: PNC Does Good. but the Financial Times suggests PNC had to have "beer goggles" on to consumate the deal. PG does something I like to do and look at these types of stories from the other angle. In Cleveland they are clearly gnashing, but more interesting is to read through the voluminous comments on the Cleveland Plain Dealer's story. No real place for commenting like that here in Pittsburgh. The occasional political spasm over on BR may be an exception... but in general no local media outlet has really invited that kind of interactivity. me: if the Dawg Pound accepts the deal, things are pretty bad up the road. PG does go into the potential negative consequences of the deal. There are some issues for sure, though I am not sure it adds up to as much as the PG story would lead you to believe. One exception to that would be the negative impact on media advertising in town. Like the demise of Kaufmann's before it, this is just another hull shot on all local news enterprises. No more Nat City advertising needed and I don't think this will increase PNC's advertising demand much. More media watching... Sunday's PG has a joint story written by both the PG and the Cleveland Plain Dealer on the PNC/NatCity merger. You know, it's no big secret that the PG owners would like to sell if they could. Maybe Newhouse Newspapers (publisher of the Plain Dealer) could buy the Post-Gazette and we could call it an even trade. and on the bigger picture. Maybe capitalism really will survive all of this turmoil. I wondered if Jim Rohr had at least some unhappy thoughts about all the bailout money being spent on all the financial institutions in the country that were in such worse shape than PNC .. not even to imply PNC was in bad shape at all. It sure looked like folks were being rewarded for bad decisions and those who had weathered the storm were being left out. It must have seemed a bit unfair though to their credit I never heard a peep like that from anyone at PNC. But if the invisible hand has not been amputated, the PNC/NatCity deal shows that good may displace bad in the long run (with a little help by the not so invisible hand of big brother). So I had a more transit type postings backlogged, but I am not sure many make sense to get into with the newest development that Port Authority management has unilaterally declared an impasse to negotiations and say they are imposing their own new contract on the drivers. I suspect the legal beagles will have to sort out if that really is the way that works. Not sure this is how it has ever evolved before which is curious. My non-lawyerly guess is that PAT really is stretching the law to think this works this way... but we will see. On the general state of labor management relations in Pittsburgh. My web/news filter picked up this interesting story of a union roundtable just the other day in town. What is odd to me is the inconguity these days of how far ahead Obama appears to be in the polls around here, yet how anti-union public sentiment has become. In another era in town there is no way the Port Authority could get away with voiding a contract as they are trying to do. Yet I suspect the public backlash will not be very much. That came to mind just because the article reminded me that the two issues are evolving in opposite ways than they should. New data for the third quatrter of 2008 is out today and still shows Pittsburgh ranked only 73 out of 100 regions in terms of the incidence of housing units impacted by a foreclosure filing of any kind. I think we have been in the 70's for some time. The 0.3% incidence RealtyTrac comes up with for the Pittsburgh region is not that much above the level for the 26 regions that come in even lower than we do. From the null space archives.. We were ranked 74 around this time last year which was data looking at the third quarter of 2007. So we have moved up one place out of a hundred. Wow, PNC buying National City. Soon Clevelburgh National Bank? OMG..New from the Feds: Maglev in Pittsburgh isn't dead..
and that is for the big high speed maglev project. Whatever happened to the low-speed maglev project that was going to be built as well? Just passing this on.. I have not seen the report this newsoid references, but it says we come in third among midwest regions in health care venture capital investment. Ahead of Chicago which is a tad larger than we are. FWIW. I was going to ignore this... I am pretty sure most don't want to hear my 'few foreclosures here' mantra again, but I have talked to more than a few of my neighbors who had thoughts similar to mine on this. On Sunday the PG had one of those "woe is us" type of real estate/foreclosure stories. Now I have to believe they looked far and wide for the best apocryphal example of the state of the real estate market here. What did they come up with? Some poor fellow who is having a difficult time selling a house in Friendship for $393K? I mean, really? This happens to be a couple blocks from where I live as disclosure. Most I talked to on this from the neighborhood thought it was just plain ridiculous. Now I am sure there has been a real significant $ amount put into improving that particular house, but you have to wonder what anyone was thinking trying to sell it at that price. Or even if that was the goal, do you really get to be upset if that proves unrealistic. Don't get me wrong, I am sure the value of the improvements are 'worth' that price, but you have to know your market. These days home improvements are costly and there are few city of Pittsburgh neighborhoods where you can expect to get an investment of that scale back. Is this a real estate market story, or a bad investment decision story? Put another way, would it not have been a much bigger story about the state of Pittsburgh if that house actually could sell for nearly $400K. Honestly, I even doubt myself these days on what the relatively benign data in the real estate market really means. But if this is the best example the media can come up with for how the real estate market has turned sour then it really comes across as more proof that things are pretty stable here. For some more concrete positive news... across the nation employment went down in September in 41 of 50 states yet in Pittsburgh employment for the same period went up by more than 10K.... at least in the raw numbers. The seasonally adjusted employment change will likely be positive, but maybe a third or half of that unadjusted change. We will get that data next week. Still, positive in the face of all that is happening elsewhere is something. Ok.. I should at least have better idea why this is, but I don't have a quick answer. But read this press release from the Bureau of Labor Statistics last week. It says that Westmoreland County ranks #1 in terms of the percentage increase of average weekly wages over the last year. #1 across the nation among all large counties! Ranking #1 could be just a reflection of how bad things are everywhere else, but +14.9% is good in and of itself. That would be a good showing in the best of times.. let alone the best of times in a Pittsburgh context. That and I am a bit annoyed in that it describes Westmoreland County as 'near Pittsburgh'. Depends on your definition of Pittsburgh I suppose, is it not part of Pittsburgh? Here is the transit metric of the day. This may seem counterintuitive, but really isn't. A new report ranks the savings per per person for folks to take public transit and Pittsburgh comes in last. Consider a couple things. We are only on that list because we are in a list of the top 20 places ranked by ridership (for now that is... see my previous post on the trends)... I suspect we rank low because congestion here is so low which blunts the public transit savings in part. That may be the real story about why support for public transit in Pittsburgh is at all time lows. The forces who dislike public transit are aided a lot by just how we have sprawled out without the penalty of congestion of most other places. What is amazing a bit is that the cost metric seems to take into account out parking costs which most consider high, so even taking that into account the costs of commuting by car here are not that high. The savings calculated for Pittsburgh come to over $8,500 per year per rider. As for transit ridership trends, you have to wonder what the future holds. The site PittsburghGasPrices.com reports at least one public retail gas outlet selling at $2.75/gallon in the region. That and the opening of 1,000 new parking spaces at the Grant Street Transportation Center Parking Lot can only work to pull commuters back into their cars. Remember when it was really intended to be a multimodal transit center? or was it? For mh or anyone who cringes at the mere mention of billboard's downtown.. there is a great quote about the future Grant Street Transportation Center in this article from 2003. Just my humble opinion, but in the big scheme of things I really think that news is bigger than even the calamitous financial news across the planet. A billion Chinese citizens gaining some of the fundamental rights of property ownership is more important to the future than most anything else in the news of late. It may not seem as significant to our investment returns this quarter, but for what it means a decade from now?? Still, I bet most Americans know much more about Willie Parker's health this weekend. Except in France maybe? I mentioned the still mysterious case of French rogue trader Jérôme Kerviel a few days ago. Just an anomaly from the past? A French bank had to disclose that it 'lost' another $800 million in an equally ill-explained 'scandal'. Nobody notices financial news of anything under $100 million these days. More important that it may appear, especially to the more technical mapophiles of the world. See Wired magazines synopsis of a case worth watching: Lawsuit Claims Mapmaking Firm Owns Your Neighborhood. So now we are part of Chippewa? So this map is just out from the Jesuit magazine America. See: New Hues for the Electoral Map by Robert David Sullivan. It says we are part of a region known as Chippewa. I dunno about that... but that light blue area is not far from a general definition of the Great Lakes region. or are we in Cumberlandia... which I would have named Appalachia+ anyway? OK…. Just to get it out of my system it may be time to give my thoughts on the financial crises as we know them. Best take this all with a grain of salt at the very least and is really just my diversion on a 10 hour plane flight thanks to a new laptop with a battery that no longer goes on siesta after less than an hour. Any comments I have on the whole financial markets miasma is at the very least above my paygrade. Certainly not anything I have looked at in depth in years although I did graduate courses in international finance and macroeconomics at one point. That only helps a bit in understanding what has been happening. What is scary is how little I really can explain the news despite the fact that I did once work at Lehman Brothers which looks to be one of the epicenters of all this. Note I don’t really believe Lehman had a unique role in all of this, but it was like having a ringside seat at the circus. Little did I know at the time that I was watching the seeds of destruction for capitalism as we know it. What went wrong? It really is hard hearing all the varying explanations of what happened. Most things being identified as the causes are at best symptoms, most things are more likely collateral damage, and in some cases just other bad events that are all getting thrown into the one big pot whether that makes sense or not . When at Lehman in the early 1990’s I actually worked on the Derivatives Products trading desk when it was a rapidly expanding operation at the time. It was a remarkable time because of the changes taking place. What Lehman and others were working on at the time was once a vast expansion in the universe of financial products being traded in entirely new markets. Nothing wrong with innovation and finance needs to evolve as much as everything else. The question is how far and how fast can financial markets change for there to be some hope for efficient market theory to come into play. The problem was that new financial products were being developed far faster than they could ever be understood by the markets that would trade them. Without being understood they would inevitably be mispriced by the markets. These new products were in many forms. The media seems to be focused on the exotic world of credit market swaps. I think this is the media story in play only because it borders on explainable in a finite number of column inches. The scary problem is that is it is just one new market that came into being, or at the very least expanded beyond all recognition in recent years. What I remember was mostly the vast world of interest rate derivatives which must dwarf the global market for credit default swaps, although I really have not seen any data on the total size of those markets… I bet nobody knows for sure how big many of these markets are. Without writing a tome, some of which would be beyond my explanatory ability anyway, the basic description is much the same as in credit default swaps. Where one product was essentially taking bets against the future credit worthiness of firms or other specific debt, interest rate derivatives are bets on how interest rates will change in the future. Seems simple enough, except there are virtually infinite number of interest rates out there and they all interact in ways that makes a complete description of the dynamics inconceivable. The various contracts that were being created to 'bet' on the possible changes in interest rates around the world and across time was no less creative than the odd bets you can make on the Superbowl. So my different view on all of this. (what? You want to hear what CNN has said 1,000 times at this point? ) At the core of the problem is a really fundamental misunderstanding of what role sheer information processing plays in just about everything. There is something of a debate that we have now reached an End of Science because of the power of sheer information technology these days. Basically the idea is there no need for the the traditional scientific method any more. If we can just set the computers to chomping though all possible answers to everything, we will get the correct answers without all that messy theory requiring things like hypotheses and testing. (yes, I really simplify, but it’s a huge debate unto itself). This is exactly what was happening at Lehman when I was there. The folks I worked with included whole banks of PhD physicists and other frighteningly smart folks who some thought were the only people able to work out the hedging that is essential for these products to be bought and sold responsibly. I actually believe their math was probably impeccable and a vast improvement over whatever was done before they worked on these problems. I am sure they created probability tables for things folks never thought of quantifying ever in the past. It just was not the right problems for them to be working on, or at the very least not the only problem to be working on. Not their fault either, the folks in charge were not asking the right questions of them if even they would have been the right folks to ask. In social sciences there is a deep aversion to ‘data mining’ which is one form of this blunt force application of reverse engineering to what others consider scientific problems. It is certainly true that sheer quantitative power can be applied to work out innumerable problems that before require a lot of analytical work to figure out. The question is whether this is merely a tool to be used to push the knowledge boundary out farther or knowledge unto itself. One problem is that the most interesting questions remain well beyond the fastest computers. I know that may sound like heresy to some, and I point out I have a degree in electrical engineering so I am not a Luddite in any way. Consider how much time, effort and concentrated computer processing power has just barely gotten to the point where machine will beat the best chess players in the world. Evidence of progress for sure, but think how simple chess is as a game. A fixed number of little squares, a smaller number of pieces and a few rules to govern play. The world is exponentially more complex than that. If IBM could even predict IBM’s stock price next week they would close up all other parts of their business and just play the market. Put much more simply, Hari Seldon has not been born yet. Doubt this IT based explanation? Consider a few things that have happened in the last couple of decades, the period when technology has exploded into the world of finance. The cases of not one but several ‘rogue traders’ that brought immense losses and in a couple cases brought down whole institutions that had previously survived wars, plagues, famines and the other vicissitudes of history. In each of these cases a single trader supposedly brought huge losses upon their employers. Yet, we really only hear about the really large cases that can’t be hidden. How many less well known cases there have been will never be known. The first question you have to ask is just how such things happened and why there were not controls. Such individual traders really could never have leveraged as many transactions as they did without immense IT infrastructure. But in each case you have to wonder why that same information technology was not able to provide greater and more comprehensive oversight. Nick Leeson in Singapore actually brought down the multi-century extant Barrings Bank. Nobody above him noticed that his positions were so badly hedged?? A failure in process? Or something much more systemic. The more recent French case of Jérôme Kerviel is even more puzzling. In his case he was more a computer person and no matter what a very junior operator more credentialed just to be doing the paperwork for the trades he was executing. That he was able to (supposedly I still wonder) engineer $billions in losses is really a mystery. A case that I still ponder happened again when I was working on Wall Street. Joe Jett who was a 36 year old trader at Kidder Peabody whose trading incurred only a $350 million dollar (back when that was real money) loss. Unlike Leeson who was put in jail for fraud in Singapore, or even Kerviel in France who is at least still under investigation, Jett never suffered any criminal penalty, suffering only a minor SEC hit for bad accounting that he probably shouldn't’t have been responsible for anyway. He claimed then and to this day not only that he was innocent of any indiscretions , that he himself thought he was making the profits that didn't exist. I am not quite sure I disbelive him either Even if the profits were mythical, the bills he created were not and Kidder Peabody would disappear due to the losses he incurred. You have to go consider again why there was not enough information technology in place to make sure more financial controls were in place in each of these situations. But in each case there was no inkling until it was too late. In these cases of rogue traders you see evidence that information technology actually created complexity exponentially faster that it could manage. All of this would play out in a more systemic failure when the Minotaur like creation known as Long Term Capital Management would come about a few years. LTCM was but a single hedge fund that exemplified the use of this technological hubris to think they were able to make money exploiting minute like inefficiencies across financial markets that supposedly were never exploited in the past. Turns out there was a reason for that. The problem was that the inefficiencies LTCM thought it was exploiting did not really exist, or at least paled in comparison to the inefficiencies in their own understanding of the markets they were trading in. They engineered such a highly leveraged and risky position that when it all came crumbling down it struck fear in the heart of the ever-implacable Alan Greenspan. The Fed would take an unprecedented and direct part in unwinding the positions of LTCM because the dollar amounts were so large and the risks to the entire banking system were great. What is playing out now is just the LTCM story multiplied out many many times across the world. We can place blame in lots of policies, individuals and institutions for creating the system that put us in this situation. Clearly lots of bad choices were made, but bad decisions are made all the time. In fact bad decisions are part of the learning curve that makes efficient markets just so. Why there was no attempt to fix the problems that caused LTCM is the question. Never has been there such a clear canary warning of the failure that was to come as there was with LTCM. And never has that canary been so completely ignored. LTCM made clear how bad the situation was and why there was not a wave of regulatory reform after it folded in 2000 may be the single reason we are in the situation we are in now. LTCM was once called the greatest private decimation of capital in Wall Street history at the time. If that was remotely true, how would you describe the last month? What does it mean and where do we go from here? That goes way beyond my paygrade. I am sure there will come a realization that the world has not ended and most of what we call the economy is continuing to function as it must. I’ve spoken with some smart folks of late who are convinced the new depression is here. It will not be a sudden realization, and some uncertainty will be a drag for a long time, but compared to any similar crisis in the past the shortness of pure denial is remarkable. Remember that from the Wall Street crash of 1929 it would be years before the New Deal was really implemented. What is happening is not all that different from where Japan found itself in the early 1990’s and they chose mostly to pretend there was no problem. Thus they didn’t have the cataclysmic spasms we are experiencing now, but they suffered a decade of recession. The level of fear prompting such quick action is itself a defining action that could not have been factored into all of those probabilistic models that got us into this situation. The human factor is yet to be quantified. Lest anyone think I am being terribly optimistic, I don’t think we are through the worst yet. Most of what I see as being fixed by all the world’s financial policymakers have been addressing symptoms and not causes. There are a number of huge markets that have to unwind because the sheer amount of counterparty risk is just not known at the moment. I hear there are whole markets (markets may be a generous term in a lot of cases) where price discovery is nonexistant at the moment. They say credit default swaps are a $60+ trillion market, but I really don’t think that the biggest problem. Interest rate swaps collectively must dwarf that number let alone the highly leveraged loan markets overall are real concerns that have not been addressed by the $trillions deployed by the world’s centrals banks as yet. There are innumerable other markets out there for everything from arbitrage on the future of the Icelandic Krona-Swiss Franc exchange rate out to even uranium futures that have huge unquantified losses for many counterparties. Many of the mostly unregulated markets are virtually chaotic at the moment. Until they unwind enough to be priced by the market they will act as huge anchors on the world’s collective money supply. If there is no believable price discovery going on then people don't know what their assets are worth. Until everyone gets a grip on their losses it remains a dangerous situation for all. All the policymakers have been doing is basically trying to buy time for these markets to come to some equilibrium. So we may not observe the final phase of the crisis as these markets deleverage, but when that finally happens we will be at a point to start over again. If you really read most of that… I owe you a beer. BusinessWeek ranks Pittsburgh in list of the best cities to ride out a recession. Strange use of city metrics not regional ones as best I can tell to some degree. fwiw. and just some more obsession on metrics: read the NYT freakonomics on The Mailman Index of Economic Indicators which discusses things like the trend in unsolicited credit card offers. and something for Schultz to work on.. via the Map Room is info about the San Francisco Solar Map. Is it even worth doing something similar here? SF is not exactly the sunniest city either. German national police obtained by the Südwestrundfunk, Southwest Germany public radio, blow the lid off the long running sting by revealing its role in nabbing a German credit card forger active on DarkMarket. The FBI agent is identified in the documents as J. Keith Mularski, a senior cybercrime agent based at the National Cyber Forensics Training Alliance in Pittsburgh, who ran the site under the hacker handle Master Splynter. I still want to know.... can anyone come up with a set of directions in Google Maps or other software that tells you to drive over a road in Pittsburgh that really is nothing more than steps? Also, you can read more about the history of the Pittsburgh Street Addressing Project from my colleagues at Pitt's School of Information Science (SIS) which they have been working on for years. So a common question of late is why the local labor force has been going up despite an increase in the unemployment rate here. Models of migration come up with an impact of the relative economic conditions in one region versus elsewhere. It's the relative part that's important. Just because things are getting worse here, if things are that much worse elsewhere it will affect migration decisions. The converse is also important. Even if things are doing well here, but if things are super-hot elsewhere, people will still leave. 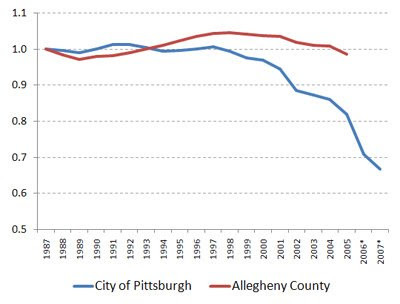 That was probably the case explaining outmigration rates from Pittsburgh in the latter part of the 1990's. How to measure relative economic conditions? Relative job growth, relative wage levels and other things all matter, but one big question in migration metrics is understanding which factor is causal and not just an effect. Relative unemployment rate seems to be a decent metric for capturing what is driving migration decisions in the near term future. Thus why I have sometimes shown my tracking of the regions unemployment rate relative to the US. But here is a different picture of how Pittsburgh's unemployment rate compares. I have mapped out the 20 regions which typically attract the most people migrating out of Pittsburgh. The size of the bubbles represents the typical size of the outmigration flow and the color represents the relative rate of unemployment compared to Pittsburgh. So in 15 of those 20 regions, the unemployment rate is worse than here. We are tied with NY for the moment, but I bet that will change given the carnage in the fiancial industry. Basically, in most of the places where Pittsburgher's usually head off to, things are bad and getting worse. So within all the regular churn in the job market here (much larger than the population change would imply), those folks who might normally be looking for, or at least be amenable, to jobs in other regions are probably finding their job prospects in those other markets to be diminished of late. Thus they stay, even if they are unemployed. Thus our unemployment may go up, but so does labor force. Likewise I bet more than a few people finding economic conditions elsewhere pretty bad are moving here sometimes after they have found a job or even to come back to look for a job. 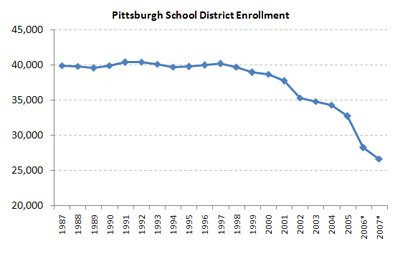 Still thinking of the Pittsburgh City School District decline. I pulled another time series from the NCES CCD data for total enrollment of students in all Allegheny County. Then I just indexed both the city school district and county numbers so that both are 100 in 1987 and then run out the trend. This is what you get. I didn't add it in here, but the Allegheny County trend actually comes in slightly better than the suburban counties taken together which is kind of interesting as well... and if you were to calculate the Allegheny County net of City trend, it is remarkably flat compared to the city proper. Just for nostalgia's sake (sorry Mike)..... but the neo-Kroger sign I came across in Tennessee cracked me up.... it's just not right. Just for fun, this is getting a lot of play if you have not seen this Youtube clip on 'vampire energy' worth watching. Schulz may like it if nobody else...... What's funny is that I poke fun at my mother who goes around and unplugs things when not in use that most of us leave plugged in always... maybe Mom really does know best? A positive story I can't be blamed for. From Time magazine this week: A Bright Spot on Main Street all about the anomalous economic trends in Pittsburgh of late. Hard(est?) hit by foreclosures, Cleveland's National City Bank is reportedly shopping for buyers and PNC is listed as a potential buyer by a report from up the pike. I am a little unclear where that story broke, but one of the earlier reports I see was from the WSJ's Dan F I bet. If it were to happen, it would be quite a deal for PNC. Ron D's column in the Trib points out that Realtor.com ranks Pittsburgh's real estate market "experienced a dramatic year-over-year 75.2 percent increase in search activity". What that means??? but Ron seems to say it's a good thing. Yesterday Ron also reported that "nonresidential construction remained strong in the quarter, with more than $1 billion in contracts awarded. Activity in the January-September period was $2.7 billion, a 13 percent increase compared with the first nine months of 2007. ". Increase? Read how Monroeville is planning for life after Westinghouse, which is growing rapidly with its planned relocation to Cranberry. I didn't catch Brian O's column last week which focused on the Zillow data/map on real estate prices within the region that I mentioned a couple months ago. As I said then, look at the map in either link and look at what is happening all around the new Children's Hosptial site. and not a local story... but some may want to watch this. The Pierce County, Washington Housing Authority has decided to file for bankruptcy. In 1997, the sitcom Seinfeld, introduced America to a new winter holiday – Festivus. The “Airing of Grievances,” one of the core traditions of Festivus, involved friends and family telling each other about all the times that others have disappointed them over the past year. We suspect that this Festivus, many Northeastern residents will be airing grievances they’re having over high heating oil prices. That's great stuff. I wish I could get away with intro paragraphs like that. Until sometime last month, one of the biggest financial nightmares a few people out there worried about was the unfunded liability of the social security system. Actuary math is... well.... actuary math.. which means it gets too esoteric to talk about pretty quickly. But the best number I see is that for over the next 75 years the social security system was under funded by something just under $4 trillion dollars. A big number for sure, but in the course of a few weeks there has come from nowhere a near unanimous agreement that we should spend how much? $700 billion on the overall financial system bailout, which would be on top of the hundreds of billions that has been spent on AIG, Lehman, Bear Sterns, and an less-discussed, but larger, amount in the hundreds of $ billions that the Fed has been mass injecting into the world financial system. Whatever that adds up to, it has to be a decent chunk of the entire unfunded liability of the Social Security system now and through all of our lifetimes.. even that of many of our children's lifetimes. Given that the $4 trillion number is something that has to be dealt with over the the bulk of the next century, the rate at which funding the system would require must come out to a expenditure rate many many orders of magnitude slower than the rate at which the US Treasury has been emptying out of late. So if we survive all of this, managing Social Security must be a piece of cake... or at the very least a hell of a lot less scary than we thought it was before. In no way is this meant to paint a rosy picture on anything happening in the global financial markets... but listening to the financial talking heads discuss what the worst case scenario is for the US they are talking about the nation hitting an 8% unemployment rate. Just in the sense of 'we know that pain', Beaver County hit 28% unemployment in January of 1983. 28% which is a rate many parts of the country would never peak at even during the depth of the depression. I know that does not help anyones 401K, but it does get to the core of whatever makes the Pittsburgh psyche unique. What stock is this chart for? I should have left the labels off of this and asked if people thought it was a) a graph of the stock market this year or b) enrollment in the City of Pittsburgh School District. The thing is it is a picture that may or may not speak for itself. If you read the stories today on the subject you basically hear a lot of people speculating when they don't need to. Is the plunge due to demographic shifts in the region? in the city of Pittsburgh? or movement of students into private, parochial or charter schools? Some things are harder to answer than others, but I am pretty sure the school district has enough data to answer some of those questions without resorting to pure speculation. Based on last years enrollment, how many students were expected to show up this coming year? and since they are paying for them they should know how many students have shown up in charter schools? And since they are responsible for transporting some of them, they also might know if more students have gone into private schools. In recent years, this is a recurrent story and each time I read it I see different hypotheses thrown out there for what is going on, it shouldn't be such a mystery. why is this exhibition happening at Ohio State and not here? Pittsburgh public school enrollment down 6% from a year ago.... not as bad as the stock market is plunging, but close. More on this later. Pittsburgh unique in that the office vacancy rate here is actually declining. Read Toland struggle with how to write a foreclosure story in a place without that many foreclosures. Still odd in that the story was all about whether the state would create a $10 million dollar program to cover the entire state.. yet only mentioned (finally but still just in passing) was the $7-8 million that the feds have targeted just within Allegheny County. So if Allegheny County gets a tenth of the state program, the fed money is still 7-8 times as much. Which is the bigger story? and aren't there bigger questions about how that $7.5 million will be deployed?? It is probably too late if you are just reading this now, but today (Monday) is the last day to register to vote in Pennsylvania if you want to vote next month. A lot of people may think they are registered, but are still registered where they used to live. So if you are not going to be able to get to your previous residence on election day, you may need to re-register as well. If you are Downtown and really want to register today, you probably want to go right over to the county elections department on the 6th floor of the county office building by 5pm today. But from earlier in the year. This won't tell you exactly where to vote, but you can figure out what voting district (precinct) you live in with some maps I made last year which work in Google maps. These are some Google Map overlays of local voting district maps I put up earlier, here are some Google map overlays for City of Pittsburgh Neighborhoods also, the KMZ file directly. Also if you are not quite sure what congressional district you are in you can look at my overlays of Pennsylvania Congressional Districts since there are a few contested races going on locally. Also, I see BurgherJon mentioned a Google Beta thing called Google Vote. But I can't get anything to come up when I try it? This really has nothing to do with the VP debate itself, but it is a thought that came to me listening to the closing comments. That and it's my pitch to fill in over at the Wall Street Journal for the Numbers Guy. What is the probability that 3 of the major candidates each have children serving in Iraq soon? So if you don't hold anything against Obama whose children are too young to even consider joining the military as yet, what is statistically odd is the fact that of the other 3 presidential and vice presidential candidates (Biden, Palin and McCain) each will have a child serving not just in the military, which is rare in itself, but all will be in Iraq at the same time. That has to be a near impossibility. How impossible? So the chance that a random American of military age is serving in Iraq is 144k/158 million or just a tad under 1 in 1,100. The probability that 3 folks picked at random are all in Iraq would be (1/1,100)^3 which works out to 1 in 1.3 billion. You need to account for the fact that McCain has 6 adult children in total, Palin has 5, but only 1 is military age, and Biden has 3 adult children. So the probability that all three have at least one child in Iraq comes out to (1/1,100)*(6/1,100)*(3/1,100) which comes out to 1 in 74 million.. You could refine that calculation in many ways. It would make sense to use some age and gender specific probabilities because the universe of folks in the military is not exactly representative of the nation as a whole. No matter how you refine it, it gets to be a small small probability. If a random event, the chance that you win powerball this week is probably higher. What's it mean? Nothing is random about who makes up the small pool of folks who wind up running for President or Vice President to begin with. How that self-selection works? Do any local institutions have something like this online? Kind of neat is the online dashboard for the Indianapolis Museum of Art. It's not always practical, but I bet if we each had an energy dashboard like that for our homes we would be more conscious of what energy we are using. Mike has his final comments over on Pittsblog and he is still firing on the uproll as we say. I've told him we will have to come up with a Phoenix like new Pittsblog at some point in the future, but we will give him his rest for now. Any suggestions for what we could pitch to him for a revamped Pittsblog? Maybe Pittsblog could become the home for all the wayward bloggers who have moved away from the arena of late. As you will see Mike was kind enough to list me as guest blogger over there. That started when I filled in for him while away once and since I have pretty much fallen away. I should have put more stuff up over there, but my honest concerns were that my daily typing would water down Mike's more measured thoughts and more importantly Mike probably didn't need some of the aggravation I sometimes cause... not that he would have minded. Mike sure sounds a bit of a downer in his last few posts. If you know Mike himself then you know he isn't like that at all which makes what he says all the more worth thinking about. I have not talked to him about it, but his tone and message sound awfully familiar to me. I won't begin to name names, but there have been a lot of people in town who have come to much the same conclusions that Mike has. Especially in academia, few have found interaction with the political or policy process Downtown very rewarding. Say something that goes against what is seen as the collective direction the powers that be want to say and basically your life becomes kind of miserable... or at the very least the costs far outweigh the benefits of such interaction. The desire for serious debate and discourse is at times virtually nonexistent. Mike had lots of great things to contribute.... and as he points out he still is and and will continue to contribute on his own. But you still have to wonder why he was not asked to contribute even more. I have seen too many other folks in town who really are the experts that should be contributing and working on the major issue in town, but have found their contributions unwanted or at the very least unwelcome. So... not to be a complete downer. I really am talking about a perspective over a decade at least for myself, and really reflections from colleagues who came decades before that even. I have learned a lot from those who came before me and tread a somewhat measured path as a result. If anything I would say things are getting better. So even granting all that Mike is saying as true, it was once much worse as best I can tell. The mere fact that this blog has not been rained down upon is some little progress.. It is something that probably would not have been tolerated a decade ago. So we may still have a long way to go, but progress is there if you look hard enough. ok, I guess that would just make it half a downer. Yes, I know that the local unemployment rate ticked up 5/10ths of a percent to 5.6%. You can see the graph I put up last week to see how that fits into the recent trend here, or compared to Cleveland and Detroit in my arbitrary. Something I don't quite know what to make of, but there still is this Monster Index there of online job recruiting and the latest data for September out shows Pittsburgh as the single hottest market they track. See page 10 of their full release. But to repeat myself, I am unaware of any research that has looked into what that index may really mean in the economy... but it is a different look at the local job market. Honestly it's weird because other than Houston, we are first by a long shot which is hard to believe. Makes you wonder if it says more about the prevalence of web usage in recruiting across different regions than something about the state of the labor market. But worth watching I am sure. Follow that story: So who really is on the Alcosan board? So last month the news was that foreclosures in the region dropped a non-trivial 29%. This month the news is again that foreclosures dropped. I hate to be a broken record, but a lot of places comparable to Pittsburgh are seeing foreclosures this year at a rate 10 times higher (or more) than what is normal for them. We are debating whether maybe, possibly, if certain trends hold, or we measure in base 5, then we will come in a marginal amount above last years rate. You will never get that perspective from 90% of the press coverage on this that I have seen... or no more than a sentence of caveat to the facts before jumping into the more bombastic stories that are heart wrenching for the folks involved in foreclosures, but unjustifiably fear-inducing for most others... and for Pittsburgh, a fear that is unjustified as yet. I have talked to folks who are not behind at all in their mortgage payments, nor expect to be anytime soon, have had no change in their employment situation, nor any other economic calamity of late, but somehow think they have to worry about their lender trying to foreclose on them out of the blue sometime soon. Why? I believe it's the coverage. Isn't there enough bad financial news to worry people with? But even so help is on the way. Little Not noticed in the media locally last week, HUD allocated $2 million to the city of Pittsburgh and $5.5 million to Allegheny County for its foreclosure-related Neighborhood Stabilization Program. They seem to have based their allocation within a state at least in part by a metric of foreclosure starts over the last 18 months. For a lot of regions being hit by the foreclosure tsunami, the amounts they are getting from this program are not enough to make much of a dent, but here within the county and given our much lower foreclosure stats, $7.5 million here could be a significant amount for the folks with troubled mortgages that are still potentially salvageable. PA's allocation and data is here. Compare that to Ohio's. Allegheny County shows a metric of foreclosure risk of 2.9%, a rate that is below every region calculated for Ohio. Cleveland is at 12.7%, Youngstown is at 14.7%. Detroit, Michigan: 16%. With all data like that, you have to think about what the lowest number could be. I am sure 0% is a goal, but even in the best of times there are some normal number of foreclosures going on. What a good number for that steady state basement number is I do not know, but if its 1-2% then you want to compare how much we are above that baseline to how much other regions are above it for a more meaningful comparison of how the national foreclosure crisis is impacting different regions. For the universe of public finance wonks who read this... that would be Fester. Municipal bond insurer FSA had its credit rating downgraded and is on credit watch negative. Why would anyone care? The Sports and Exhibition Authority funded the arena with variable rate debt that is insured by FSA so the credit worthiness of the bond insurer could impact how big the bond payments are. Anyway, there was some news back and forth a few months ago over the question of whether the state was truly obligated to make up funding that may or may not come from the casino for the arena bond. That issue may appear to have dissipated with the turnover in the casino ownership, but I still wonder. For months now the news on the local housing market has been that the number of sales is way off. Part of the reason for that is not so surprising. Where do most people moving to the Pittsburgh region come from?? Cleveland, Washington DC, New York City and Philadelphia are a huge part of the migration flow into Pittsburgh. At least Cleveland, DC and NY are near the center of the real estate meltdown of late. What does that mean. I am pretty sure there are folks who essentially trapped in the homes they live in... either can't pick up and move here because they are unable to sell their existing homes, or who might be moving here, but can't buy a house here until their previous home sells. At the same time, job market weakness in those other markets is depressing the incentives some here might have to move to jobs in those other regions. If you don't move, then you don't have a reason to try and sell your house here. The real estate-migration link jibes pretty well with this Slate story the other day covering some real economic research that documents how depressed real estate values essentially trap people in their homes. The net result: a huge inefficiency in the labor market nationally. That real-estate induced lack of migration is by the way is a short term version of what I am pretty sure happened across the region in the 1980's as lower home values kept folks from moving as much as they might have otherwise. Thus the statistic that pops up on occasion that Pittsburgh (city or region) is typically near the top in terms of what percentage of households have lived in their current place of residence for 30 or more years.